Brick wall built near Meopham in Kent. An English bond wall with old bricks using traditional sharp sand and lime mortar method. This allows for any long term movement without any large cracks appearing. Lime mortar wall construction is a more time consuming way to build, but well worth it for brickwork that stands the test of time. The yellow and multi bricks have a warm earthy feel against this dark limestone paving. 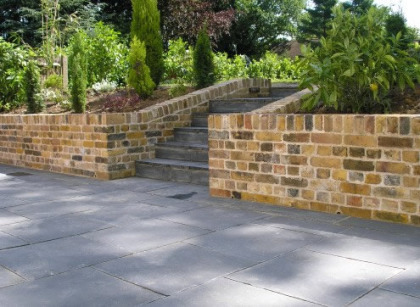 Rob McGee & Son design, build, rebuild and maintain old garden walls in Kent, London, The Southeast. For further information call 01233 740389 or email.